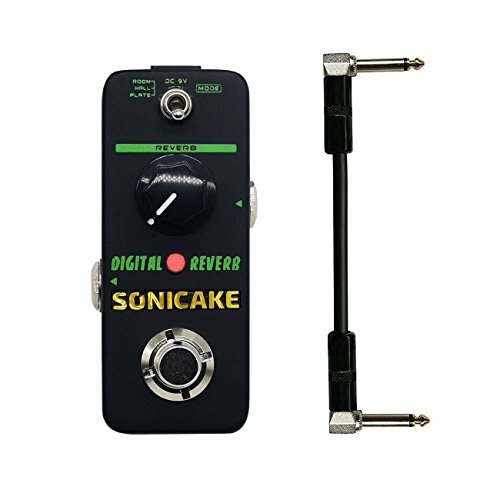 SONICAKE Digital Reverb is reverb pedal designed to add dimension and spaciousness to your tone. It is extremely straight-forward to use with only one "Reverb" knob to adjust the balance between the raw dry signal and the reverberated wet signal. With 3 most basic reverb modes, Digital Reverb can take your dry guitar sound from a small session room to a vast space, like the Albert Hall: Room: Simulates the spaciousness of a room. Hall: Simulates the spatial dimension of a music hall. Plate: Simulates the unique reverberation character only coming from a plate reverberator. 3 most basic reverb modes: Room: Simulates the spaciousness of a room; Hall: Simulates the spatial dimension of a music hall; Plate: Simulates the unique reverberation character only coming from a plate reverberator. One reverb control balances the dry/wet signal, simple enough to dial in the perfect amount of reverb for your tonal needs. True bypass for zero tonal coloration. Extreme mini size for great compactness. Heavy-duty metal casing for great stability and durability; Connectors include input, output, and power supply; Powered by 9v DC. W/ a 6 inch patch cable included.